I'm going to be hanging four pieces for a show of Montgomery Art Association members at the Amici Miei restaurant this weekend. 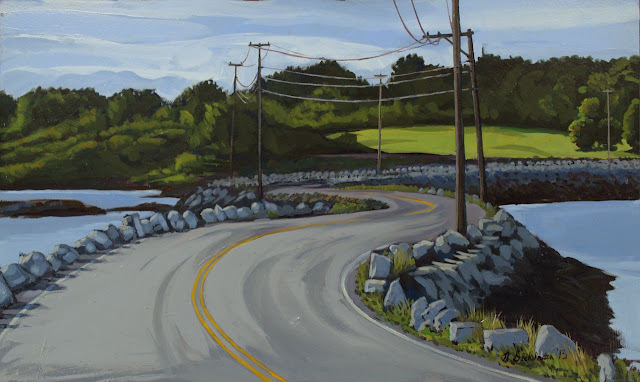 The opening takes place Sunday, December 1 at 3:00 PM at Amici Miei, 1093 Seven Locks Road near Rockville. The show will remain there until late January. 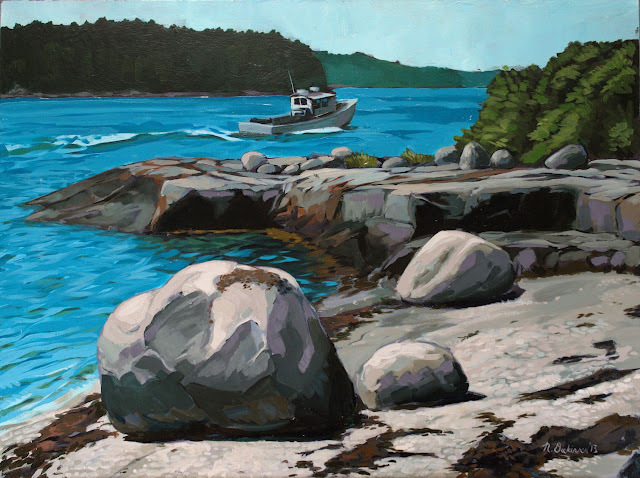 As much as I love painting pictures of Maine, as a sole subject it is difficult to sustain year round from 700 miles away. Plus it will feed back into the landscapes if I can experiment with different approaches and treatments that other subjects elicit. Over the past couple of weeks I've been trying out a few things. 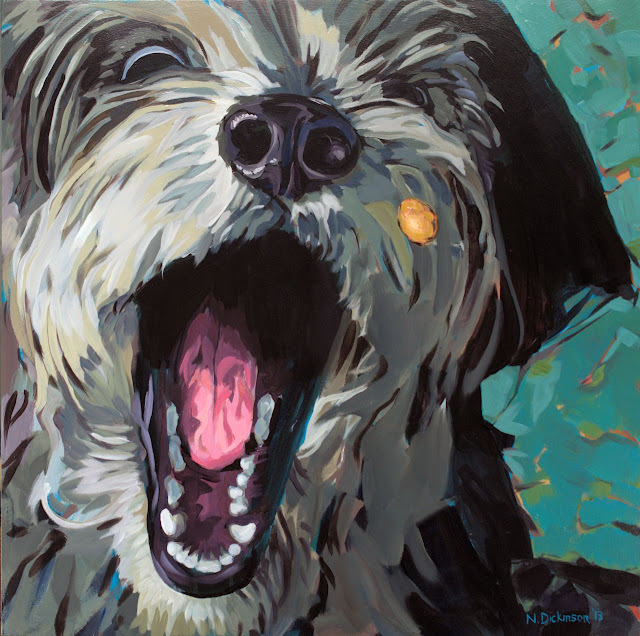 First off I painted a large 24" painting of our dog Pappy in action-- it suggests some of that instagram/selfie sensibility with the square format close-up. It was a fun departure, recalling the "Parts of My Dog" series. I found a big box of old paintings and prints, most unfinished, that I was considering throwing out. 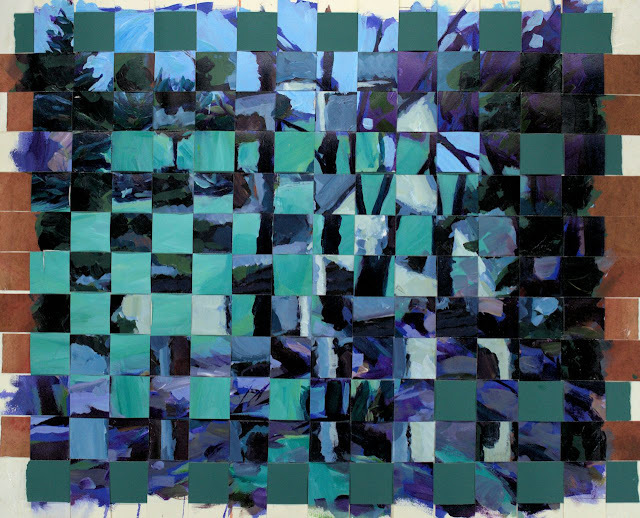 Then I decided I should cut them up and weave them together-- I sort of stole the idea after visiting Kevin Hogan's studio in Asheville. The exercise was pretty mindless, but they are kind of interesting. I would have said there wasn't anything to look at in the intact unfinished paintings, but I can look at these woven paintings for hours.